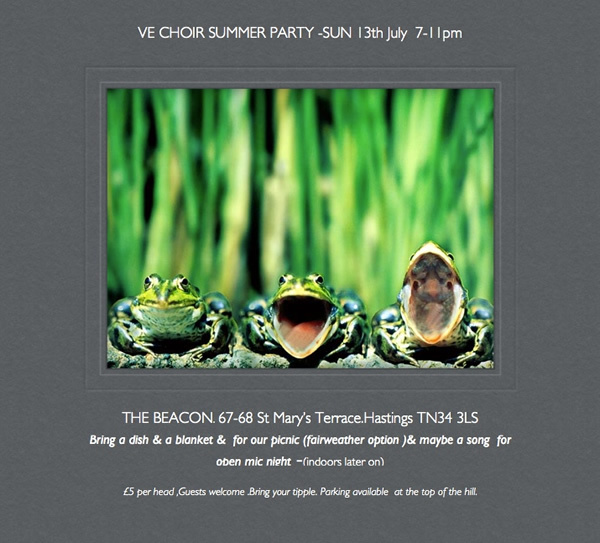 The lovely Beacon has been booked-which has a great outside garden & inside space too.So weather permitting we will start with a picnic outside(please bring a blanket & a dish) -if raining then indoors from 7pm. The St Leonards festival finishes at 5pm so plenty of time to get to the party. And then after the picnic we will do an open mic -plus hot world music for shakin yer booty! Or bring an instrument & play along with our resident duo’Clench’. Bring your favourite tipple (no bar).Please feel free to bring guests. Just to cover costs its a flat £5 fee per head .